Fed up with the political repression and economic malaise that have been central features of President Hosni Mubarak’s 30-year-rule, the Egyptian people have hit the streets in the hundreds of thousands for the last ten days to demand Mubarak’s removal from power. After a week of hemming and hawing, the Obama administration on Wednesday declared that Egypt’s transition to a new government “must begin now.” But many of the Egyptians at the forefront of the ongoing protests reject Washington’s stated support for political change, saying that the US — despite its democratic pretensions — has no real desire to see an end of the Israel-friendly regime in Cairo. On January 25, popular demonstrations originally organized to protest police abuses and official corruption quickly snowballed beyond anyone’s expectations. Thousands of protesters — tens of thousands in some areas — turned out across the country to demand free elections and the termination of Egypt’s draconian Emergency Law. In addition to these political grievances, demonstrators also demanded relief from crushing inflation and rampant unemployment. “The vast majority of those participating in the demonstrations are ordinary Egyptians fed up with the political and economic status quo,” Sarah Ramadan, 20-year-old political activist from Cairo, told Veterans Today. For the next nine days, demonstrations staged countrywide grew in size and intensity, with the biggest being held in Cairo’s centrally-located Tahrir Square. As security forces used increasingly violent methods to quell the protests, offices of Mubarak’s ruling National Democratic Party (NDP) — along with many local police stations — were burnt to the ground in provinces across Egypt. On Friday evening, the Egyptian army was deployed on the streets of Cairo, Alexandria and Suez. But despite the imposition of government curfews, demonstrators remained on the streets, vowing to step up their protests until their demands for Mubarak’s ouster were met. Hundreds of protesters have been killed so far and thousand injured in violent clashes with police. Exact casualty figures, however, remain unavailable. On Saturday, Mubarak dismissed his government — which had been dominated by a clique of unpopular business tycoons — and appointed a new prime minister. In a first since becoming president in 1981, Mubarak also appointed a vice-president, fulfilling a longstanding demand of the Egyptian opposition. The new VP, General intelligence chief Omar Suleiman, would be tasked with “holding dialog” with various opposition forces, the president said. In a televised address on Wednesday night, Mubarak stressed his commitment to the nation’s “security and independence” so as to “ensure a peaceful transfer of power in circumstances that protect Egypt and the Egyptians.” He went on to say he would not seek a sixth term as president in upcoming elections slated for later this year, and promised to amend articles of the constitution that regulate the electoral process. The promises, however, failed to satisfy demonstrators, leaders of whom say they want nothing less than the removal of Mubarak and anyone associated with his longstanding regime. But many of the Egyptian activists at the center of the storm showed contempt for Washington’s tepid show of support, saying that the US commitment to Egypt’s “stability” — and, by extension, Israeli security — far outweighs its commitment to Egyptian democracy. A number of other Egyptian demonstrators who spoke to Veterans Today echoed this view. Egypt has had diplomatic relations with the Zionist state since the signing of the Camp David peace accords in 1979. Since then, the US has provided Egypt with some $28 billion in development aid and a further $1.3 billion in annual military assistance, making Egypt the second largest recipient of US largesse after Israel. The only other Arab country to have official relations with the Zionist state is the Hashemite Kingdom of Jordan, which signed its own peace deal with Tel Aviv in 1994. In return for the kindness, the Mubarak regime has continued to implement a number of policies advantageous to Israel, despite widespread public opposition. These include assisting Israel in its four-year-old siege of the Gaza Strip — which has subjected the strip’s 1.5 million people to humanitarian catastrophe — and selling Egyptian natural gas to Tel Aviv at prices lower than those at which it is sold to the poverty-stricken Egyptian public. Many observers believe that free elections in Egypt would likely yield a dramatic reorientation of Egyptian policy vis-à-vis the self-proclaimed Jewish state — one much more in line with public opinion. Even before the uprising in Egypt, public statements emanating from Israeli officialdom indicated Tel Aviv’s approval of — and support for — the Mubarak regime. Notably, on January 28 — as demonstrations in Egypt entered their fourth day — Binyamin Ben-Eliezer, a member of Israel’s Knesset and former defense minister, likewise expressed support for the beleaguered Egyptian president, playing down the threat posed to the Mubarak regime by the rapidly burgeoning uprising. Israeli Prime Minister Benjamin Netanyahu, meanwhile, has instructed his ministers to refrain from commenting publicly on events in Egypt. But on Monday, reports emerged that the Israeli Foreign Ministry had directed its diplomats in the US, Canada, China, Russia and Europe to impress upon their host nations the importance of Egypt’s stability. “We are closely monitoring events in Egypt and the region and are making efforts to preserve its security and stability,” Netanyahu had been quoted as saying one day earlier. According to Kandil, such gestures of support for Mubarak on the part of Israeli officialdom “reveal the Mubarak regime’s extreme importance to Israeli strategic interests.” He went on to recall statements by Ben-Eliezer last year in which the latter referred to the Egyptian president as “a strategic treasure” for Israel. Most recently, on Thursday afternoon, Iranian satellite news network Press TV reported that a group of demonstrators in Cairo had “captured a member of the Israeli General Staff Reconnaissance Unit” who was attempting to infiltrate the demonstrations. While the network showed amateur video purportedly taken of the event, this remains unconfirmed. As of press time on Thursday evening local time, the anti-Mubarak demonstrations were still going strong, despite fresh violence that saw at least five protesters killed in Tahrir Square — and thousands injured — within the last two days. Nevertheless, demonstrators plan to redouble their efforts, and even larger protests are expected after Friday prayers tomorrow at noon. 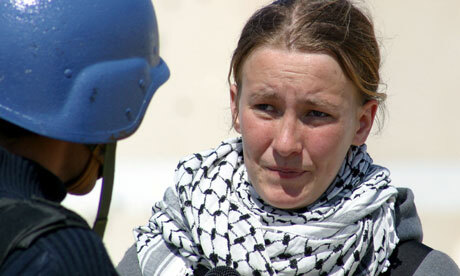 <–American peace activist Rachel Corrie being interviewed in the Rafah refugee camp in Gaza Strip a few days before she was killed by a bulldozer. The Israeli soldier at the controls of a bulldozer that crushed to death 23-year-old Rachel Corrie in Gaza in March 2003 is due to give evidence tomorrow in the civil lawsuit brought by the American activist’s family. However the judge hearing the case in Haifa has ruled that, for security reasons, the soldier can testify anonymously from behind a screen, denying Cindy and Craig Corrie the opportunity to face the man who directly caused their daughter’s death. Israel‘s supreme court refused to hear an appeal by the family challenging the judge’s ruling. However, the unit commander in charge that day will testify in full view of the court as his identity is already known. “I’ll be grateful at least to be able to hear [the bulldozer driver’s] words but I won’t get the complete picture and I’ll be disappointed by that,” Cindy Corrie said in an interview in Jerusalem last week. Corrie, from Olympia, Washington state, was killed while attempting to protect the home of a Palestinian family in the Rafah area of Gaza from being demolished by Israeli troops seven and a half years ago. A posthumous book and play based on the graphic and moving emails she wrote to friends and family made her an iconic figure. An internal Israeli military investigation, which was never published nor released to the US government or the Corries, concluded that the bulldozer driver had not seen Rachel and that no charges would be brought. The case was closed. The family brought a civil case – “absolutely our last resort” – against the state of Israel, which opened in March this year and is expected to conclude early next year. Among the early witnesses was a fellow activist, Briton Richard Purssell, who described how Corrie disappeared from view under the advancing bulldozer. At the very least, the family hoped their legal battle would shine a light on the Israeli Defence Force’s (IDF) investigative process. Cindy Corrie said if the IDF were, as it claimed, the most moral army in the world, “they should be willing to look at a system that is much more transparent than what exists right now”. Last month, a colonel responsible for writing operating manuals for military bulldozers, testified that there were no civilians in a war zone.